The Sherpas are not medical science doctors, but they save hundreds of lives in the treacherous Khumbu icefall on Mt Everest by securing routes for mountaineers. Sherpa climbers and their clients, who have scaled Mt Everest (8848 metres), the highest mountain peak of the world, reckon Ang Kami Sherpa, Ang Sarki Sherpa, Ngim Dorjee Sherpa, Mingma Chhiri Sherpa, Yangda Sherpa, Mingma Temba Sherpa, Nima Wangchu Sherpa and Dawa Jangbu Sherpa as ‘icefall doctors,’ because of their sheer expertise in carving out routes in the Khumbu icefall (5800 m), which is the gateway to the summit of Everest. They are surely not medical science doctors, but they save hundreds of lives in the treacherous Khumbu icefall by securing the routes, while they make the otherwise arduous climbing easier. Khumbu icefall is located between the Everest base camp and the higher camps (camp one, camp two, camp three and camp four) that eventually lead mountaineers to the summit. It is a mass of glaciers with deep ice crevasse, undulating ice moraines and frozen ice cliffs, and one can make to higher camps only after going through an ordeal at the icefall as they have to walk across the ladder laid between the ice pillars. Sherpa climbers in unison accept that Khumbu icefall is the most treacherous and unsafe section en route to camp-one because there is constant danger of the ice breaking anytime. In order to avoid danger of being trapped there, mountaineers try to cross the icefall after midnight. ‘Since ice remains frozen at night, there is less chance that it will break,” says Lakpa Tasi Sherpa, a climbing Sherpa who has been working as an expedition Sherpa for several years now. Therefore, climbers laden with equipment try to leave base camp (5380m) by 2 am and pass through the Khumbu Icefall in the wee hours before reaching camp-one. Reportedly, during the climbing season, a team of eight icefall doctors and two kitchen hands normally leave for the Khumbu icefall much ahead of the arrival of commercial climbing teams because they owe responsibility of ensuring safety of the climbers by installing aluminium ladders across the deep crevasse, fixing ropes and pegs, pitching safety pitons and making ice routes up to the second camp. They are entrusted with performing unsurmountable jobs because of their past experience, technical knowledge of laying the ladder, practical knowledge as to when and where the icefall is going to break, while they are also thoroughly conversant with the mountaineering technique. To mention it, icefall doctors give shape to their job by stationing themselves on acclivitous snow under the shade of temporary tents. Thus they are available 24 hours to fix problems and in a critical situation, they can be trusted to help rescue climbers. Icefall doctors are deployed in the icefall for 75 days, and they form the last human entity to leave the mighty Everest after an expedition team descends to the base camp after conclusion of the climbing season. This indicates that icefall doctors spend half of the year in temporary shelters in the Khumbu icefall, catering to the needs of the climbers. There are basically two climbing seasons (spring and autumn) when mountaineers attempt to scale Mt Everest through the Nepal side. A report has said that there have been at least 5328 summits of Mt Everest after the historic ascent of 1953 by Sir Edmund Hillary and Tenzing Norgay Sherpa. The Sagarmatha Pollution Control Committee, (SPCC) a local body, which is authorised by the Government of Nepal to regulate garbage in the Everest region and also make ice routes up to the second camp, employs icefall doctors for a handsome salary and other remuneration. However, icefall doctors claim that their salary, which is little over US $3000 per season, is not commensurate with the amount of work they do at the cost of their lives. Until today, thousands of humans have set foot atop the tallest mountain and have won accolades, but the contribution of icefall doctors often goes unnoticed and their names are unheard of. 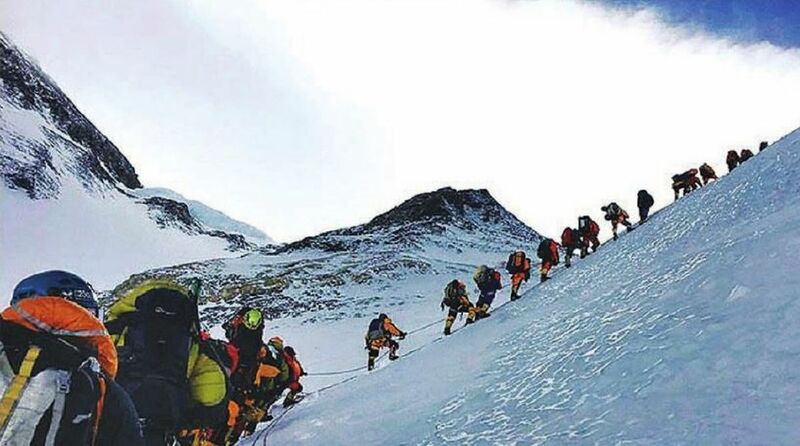 However, the mountaineering fraternity does acknowledge the role of the Sherpas and respects them. The name of Ang Kami Sherpa from Chaurikharka village in Solukhumbu district in Nepal stands out among the icefall doctors. The climbers respect him for his excellent work in cleaving a safe route in the icefall for the last 20 years. Despite his faltering age (66), he tries to show unwavering devotion to his work by camping himself at the Everest base camp so that other icefall doctors can access him for guidance and instructions. Since their job involves risk of natural calamities, icefall doctors propitiate mountain gods and spirits with the help of a Lama (monk) before starting their venture, while the Lama interprets the Buddhist liturgical text to find out the auspicious time and day to begin their work. Likewise, their family members back home pay obeisance to the mountain gods by burning junipers for the safety of their bread earners. To the Sherpa people, the female deity Jomo Miyo Lang Sangma provides food and resides at the Jomolangma or the Everest. How Sherpas came to be associated with the unique work in the expedition history may be of interest to climbers and readers alike. Expedition and trekking is the main source of income for a majority of the Sherpa population in Nepal for the past many decades. Since the year 1907, when Sherpas were first recruited by European explorers and the reconnaissance team and the historic conquest of Mt Everest, there has been no turning back. The Sherpas have since then continued to pursue their career in mountaineering at various levels of work such as guides (sirdar), climbing Sherpas, cooks, kitchen hand and porters. Interestingly, Sherpas’ association with mountain climbing began from Darjeeling in West Bengal in India, while the historic 1953 Everest sojourn began from suburban Ghoom, a few km away from Darjeeling town. The icefall doctors are distinguished for possessing inherent qualities of tremendous physical strength, high altitude adaptability, knowledge of the surrounding peaks, sound judgemental power, willingness to work under the most hazardous weather conditions, and courage to face adversities at the highest mountain and training. The author, a freelancer, is based in Sonada, Darjeeling. She was associated with Nepal’s mountaineering industry for several years earlier.